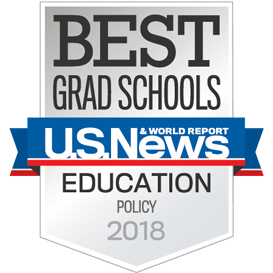 With an emphasis on student-faculty mentoring and applied learning, our Educational Policy Studies Ph.D. program prepares graduates to directly impact educational policy through careers in academia or research organizations. This is a research-based, full-time program that is offered in Charlottesville only. Policymakers at the federal, state and local levels are actively exploring strategies to improve educational outcomes for all students. Increasingly, these strategies include dramatic changes in the way schools are organized, in who teaches and how these teachers are prepared, and in how schools are held accountable for student outcomes. Unfortunately, there is little good evidence on which to base many of these important policy decisions. This has led to a growing need for careful, experimental and quasi-experimental and descriptive research to inform key education policy issues. While coursework is important to student preparation, a close mentoring relationship with faculty is crucial to the design of the program. Students work closely with faculty on research projects to examine the impact of a variety of educational policies on student outcomes. Graduates are prepared to take positions in academia or research organizations. In addition to earning a Ph.D. in Education, many students pursue the MPP through UVA’s Batten School of Leadership and Public Policy. "The interdisciplinary nature of EdPolicyWorks has exposed me to theories of human behavior from a variety of disciplines." Pioneering student Eva Galdo is the only third year in the growing Batten/Curry MPP/PhD dual degree program. "EdPolicyWorks and the Education Policy Ph.D Program do a great job of exposing students to really smart, thoughtful people." CONTACTING FACULTY: Identification of a core faculty member with interests similar to yours is strongly recommended. It is highly encouraged that you directly contact one or more faculty members to discuss your research interests. Please contact faculty via email to set up a time to talk either over the phone or in person. REQUIRED MATERIALS include the online application (which includes the statement of professional goals), current, unofficial test scores (official scores are required after acceptance of admission, unofficial transcripts (official transcripts are required after acceptance of admission), and two recommendations. Please also submit a resume. When submitting a statement of professional goals, identify your specific interests in education policy, your rationale for applying to this program, and your long term goals. Applicants should demonstrate a background and interest in quantitative approaches to educational policy, as evidenced, for example, by appropriate social science undergraduate or master’s degrees or prior work experience. In addition to the Ph.D., Curry offers a dual Ph.D. and Master's of Public Policy in conjunction with the Frank Batten School of Public Policy. We strongly encourage applicants to apply to the dual degree program. Completion of a COMPREHENSIVE EXAM and DISSERTATION REQUIREMENTS. Applicants are automatically considered for research assistantships funded through faculty grants or the EDLF Department. A typical package through the Curry School provides tuition, health insurance, and a biweekly wages in return for 20 hours of weekly work. In 2014, Curry was awarded a grant from the U.S. Department of Education Institute of Education Sciences to fund the Virginia Education Science Training (VEST) program to train future leaders in education research. A limited number of fellowships are available each year and application is very competitive. All applicants to the Educational Policy PhD program are automatically considered for VEST Fellowships. * Any deviations from these requirements must be approved by the program committee. Graduates are prepared to take positions in academia as postdoctoral fellows or university faculty, or as education researchers in research organizations.